Our Goals Webelos is a program for 4th graders to prepare to join a Boy Scout Troop while learning outdoor skills and participating in different adventures. A well-run group of Webelos is a gradual change from being an 'adult-run' den to being a 'boy-run' patrol ready to fit right into an adventurous scouting troop. 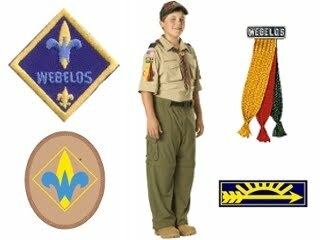 Webelos is for 4th graders to prepare to join a Boy Scout troop while learning outdoors skills and participating in many adventures. A well-run group of Webelo Scouts is a gradual change from being an 'adult-run' den to being a 'scout-run' patrol ready to fit right into an adventurous Boy Scout troop. This migration requires the parents and den leaders to give the scouts more and more control, decision-making power, and responsibility as they progress in skills, abilities, and maturity. Additionally, Webelo Scouts camp regularly and work with a Boy Scout Troop to prepare to become a Boy Scout before the end of 5th Grade.